It is 41 years since the Hogan Cup crossed the Mayo border, when St Colman's, Claremorris, claimed the famed schools' football title back in 1977, it is 21 years since a Mayo team competed in the final of the competition when St Gerald's, Castlebar, lost out in Croke Park, and on Saturday it is the turn of Rice College, Westport, to have a crack at glory. 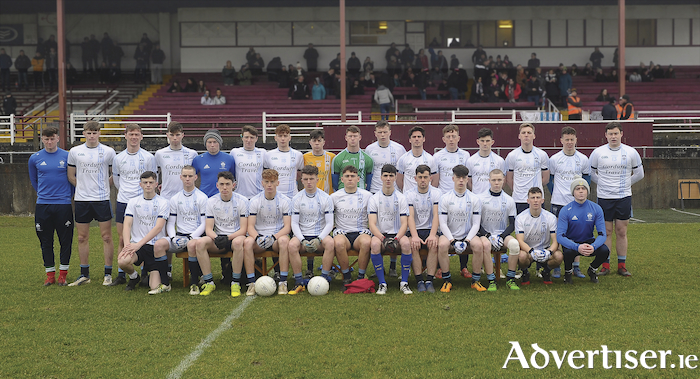 The Westport school made history this year already by claiming their first Aonghus Murphy Cup, beating St Attracta's Community School, Tubbercurry, in the Connacht final in Tuam. Rice won out that day 1-13 to 1-10 with a gritty and hard working display, they followed up in the All Ireland semi-final against Naas CBS where they took control of the game after half time and never looked back, winning out 0-13 to 1-7 at the final whistle. Team captain Pat Lambert showed his leadership in spades in the All Ireland semi-final kicking five points and putting in a devastating display when he went into the full forward spot for the second half. Lambert is looking to keep up a family tradition too, with his father Charlie winning a Hogan Cup medal with St Jarlath's, Tuam, back in 1984, and his brother Paul picked up an All Ireland intermediate club title with Westport last year in Croke Park. While Lambert has been the inspirational leader on the field, off the field this group of players have been guided by the steadying hands of Martin Connolly and Shane Conway. Connolly has been a driving force for football in the school for many years and Conway in more recent times has added his own stamp to things. The team is supplied by just four clubs with Westport, Burrishoole, Kilmeena, and one interloper from Clonbur added to the mix. There will be plenty of support from all clubs on Saturday in Croke Park for the Westport boys. The Rice College defence will have to be on their toes from the off and Eoghan McLaughlin, who put in a powerful shift in the semi-final, will be looked to lead that line from the lynchpin position of centre half back. He will be ably supported by Rory Brickenden, Michael Brady, Luke Dawson, Jack Carney, and Ray Walsh in front of goalkeeper Cian Kennedy. The Burrishoole duo of Patrick Chambers and Fintan McManamon have been a towering pairing all year and they will be looked to to get control of that sector and drive on the Rice attack. Up front the aforementioned Lambert can be counted on to lead the line for the side — be it inside in the full forward position or further out the field. Keith Joyce, Luke Tunny, and Mark Moran have all shown they know where the posts are, while the physical presence of Stephen Loftus will be a handful for their opponents along with the movement of Cillian Heaney. As for their opponents on Saturday, St Ronan's, Lurgan — they, just like Rice College, claimed their first ever provincial A title this year winning the MacRory Cup, but the school has only existed in its current guise for the past three years, following the amalgamation of three different schools in 2015. In the All Ireland semi-final, they laid down a serious marker of intent seeing off a very fancied Pobalscoil Chorca Dhuibhne from Kerry that were managed by Kerry senior manager Eamon Fitzmaurice. The Kerry school had claimed the Hogan Cup twice in recent times in 2014 and 2015. In the Ulster final they beat the defending champions St. Mary's Grammar School, Magherafelt, 1-9 to 1-7. It is all down for decision this Saturday in Croke Park, with the game throwing in at 4pm.